You’ll soon be able to stop lying to your dentist about how often you floss, because apparently flossing is another one of those health myths based more on "uhhhh, this sounds kinda right?" than actual fact. Like antibacterial soap and cow’s milk, flossing is one big elaborate ruse from The Man to coerce you into spending your hard-earned money. In this case, $1.99 on a pack roughly once every three years. This is according to the Associated Press, not old Bleeding Gums Murphy. The AP went full Woodward and Bernstein on Big Floss since they noticed flossing wasn't part of the 2015 Dietary Guidelines for Americans. They asked the departments of Health and Human Services and Agriculture why, and got no response. SHADY. Flossing had been a government recommendation since 1979, then mysteriously disappeared... which tipped off the Associated Press to the seedy underbelly of the floss industry. 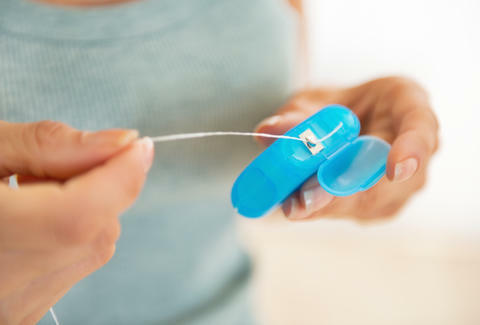 So they went digging, looking at 25 studies on flossing over the last decade. What did they find? The "missing" girl had disguised herself as the kindly old amusement park owner. Oh, wait, different investigation. They found: “The evidence for flossing is ‘weak, very unreliable,’ of ‘very low’ quality, and carries ‘a moderate to large potential for bias.’” Almost as salacious! Those are fightin’ words, considering the American Dental Association claims, "Cleaning between teeth is essential to your daily oral hygiene routine." Lies! Whether or not flossing is effective may not seem like a big deal, but this is a slippery slope -- if you don't have to floss every day, what other health advice from your parents is a lie? Do you really have to eat your vegetables every day? Is soda all that bad for you? Will your face actually stick that way? Is cough syrup a fun and totally OK way to catch a legal high? The AP may have saved you 30 seconds in the evenings, but you'll never look at your parents the same way again. Christina Stiehl is a Health and Fitness Staff Writer for Thrillist who will be using her leftover dental floss to make bespoke jewelry, available for sale soon on Etsy. In the meantime, follow her on Twitter: @ChristinaStiehl.